As I write this blog, our Association is ending another record year in revenue and net assets for 2012, further strengthening us to do some dynamic things for our members without charging extra dues. Our incredible run over the last 7 years has not been by luck, but by a systematic and strategic set of innovative measures to maximize membership value. Whether it's your association staff, volunteers, leaders, or just your members, we push a massive amount of content and information through all those channels. The options available to us are unlimited in pushing out content including: social media, conferences, print newsletters, e-news, videos, and blogs...you name it, it's out there. This year the big question you need to answer is: Are we allowing people to just "collect the dots" or are we helping them "CONNECT the dots" in our association? You see, there is a difference. 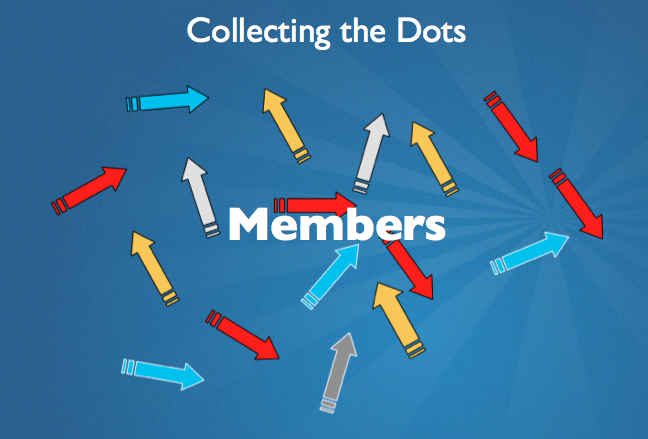 If you are simply pushing out information, creating benefit programs, or writing down everything the speaker says at a conference and not connecting that information, program, or idea to an action step to improve your members, career, or business, you are simply "collecting dots". When you only "collect dots", you only have dues paying members and higher cancellation rates. However, when you "CONNECT the dots" of information, programs, and ideas to specific struggles your members have everyday, you then CONNECT them to your association in an emotional way that leads them to be not just dues paying members, but BELIEVERS. I'll give you a quick example. I sit in conferences and watch people write down everything a speaker says without any regard as to what they are saying, and what it means to their association. They are simply "collecting the dots" that will never move into action. But then there are the people like us, who don't write anything down the speaker says until they say something that is an idea that can transform how we do something in our association...that is what we write down...and that is what we come back and execute. You see, if you had the choice of your staff sitting in a classroom and writing 8-pages of legal pad notes of information, or having them skip the afternoon sessions and hang at the pool with 3 top association executives, where they learned 2 incredible ideas for your association, which would you prefer? Most of you reading this would struggle with that because you say you don't pay your people to go to the pool at a conference. You pay them to go to class, yet you passed on the "CONNECTION of dots" at the pool and went for simply "collecting dots" in a classroom. Now don't get me wrong, I believe there is good work done in the classroom. My point is, we have to think differently about our actions and truly ask ourselves as we make decisions on programs, communications, etc., is this going to "collect the dots" or "connect the dots" with our leaders, members, and staff? Another example is when I was having dinner with a member and two of his key managers. As we talked about the standards and audits that they have to live by, it became very apparent there was a service that our association could provide, that would be life changing for their business, and could help them to improve their process and save thousands of dollars in future audits. That is a dot that CONNECTS them emotionally to our association and will bring us new members as well. 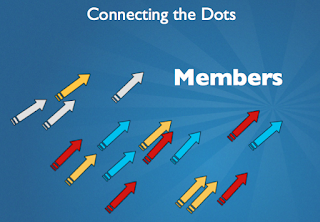 Remember, you are better off having just 4 programs that "CONNECT the dots" for your members, than 35 programs that fill up a benefit page and just "collect the dots". MEMBER VALUE is driven by the quality of impact of programs, not by the number of them. If your association is struggling to get your board or your staff to make the changes you need to make to "CONNECT the dots", maximize member engagement, see new non-dues revenue for your organization, and build member loyalty, consider my half-day Association Innovation Think Tank. It will put your association on the right track to "connecting the dots". Those who are battling the strong winds, the ones who are most successful, are the ones who simply adjust their sail and change direction.